To reduce your plastic footprint, start with your shopping basket. Shop in bulk and bring your own containers from home. Mother Earth will thank you, as will our turtle pals in the Pacific just a few blocks west. At Other Avenues, “Healthy Planet” is key to our mission and we strive to avoid as much unnecessary packaging on our shelves—and on the planet—as possible. We offer organic produce, grains, beans, dairy, eggs, bread, snacks, coffee, tea, body care: all the good stuff, and all available with little to no superfluous plastic. Look for me in Aisle 5, the Bulk alley, shoveling organic oats into a hefty Ziploc the width and height of a baby. Even if you don’t consume oats with as much fervor as I, you too can discover a love for bulk foods and the ease of a plastic-free lifestyle. Read on for a quick guide to shopping with less plastic at OA. It all starts with a bag… or two or three. a sense of adventure and patience for learning something new! There’s no need to necessarily buy new for any of the above. Imagine the word recycle in a literal sense and you get the idea. Food jars can be washed and reused, old plastic bags ditto, and olive oil can be topped up in its depleted container. Once you have your stash, think about what you normally buy and if it can be replaced with a low-plastic or bulk alternative. The idea here is not about perfection, but doing what you can, when you can! We have jars, bags, and compostable plastic containers for sale if you forget yours. First, weigh your container/bag on the scale provided—in bulk speak, tare it– so that we can deduct that weight from the cost of purchase. Record the tare weight on a sticker, a notepad, or your phone. If you need help, ask us for assistance. Whatever you choose, fill up your container and record the 4-digit number noted on the bin. Some folks use their phone to snap a photo, while others out-smart the phone and memorize. I prefer to use scrap paper, but there are stickers and ties available as well. Let myself, or another friendly cashier, do the rest! For every bulk jar or container brought from home, we’ll knock off 5 cents for your efforts. Save the planet, save some cash. 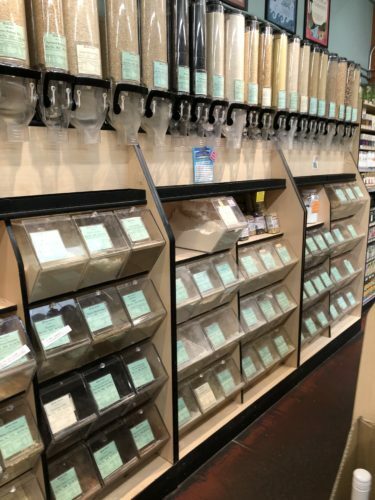 Without dipping to much into hyperbole, our Bulk section is one of the finest resources for plastic-free living in San Francisco. Beans, flours, chocolates, dried fruits, seeds, nuts, tortilla chips, coconut flakes, and more are available for your pleasure. Might I add: nut butters, olive oil, and a slew of other cooking liquids. Of course our Produce, Bread, Chill, and Bodycare sections are also amenable to plastic-free living. Normally buy peanut butter in a jar? Take your own and fill ‘er up with the bulk stuff. Love sandwich bread in a plastic bag? Indulge in the exquisite fresh baked loaves from Marla Bakery, Rosalind Bakery, or Semifreddi’s- all baked fresh and sold in a paper bag. Buy milk in a Straus glass container and return it next time for a $2.00 refund. It’s all about those easy changes that form the foundation of the plastic-free revolution. Don’t let perfect be the enemy of the good. Start where you are, and have fun doing it. See you at the bulk bins!